We have two DMZ Vfilers - one in Site A and one in site B. These DMZ Vfilers already belong to an ipspace, and have two IP Addresses each - one for management and one for the DMZ. 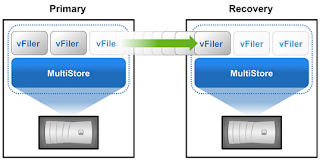 Now, VMware Site Recovery Manager cannot use Vfiler DR, so we need to configure SnapMirror in the Vfiler context. Slight problem: the DMZ network is not routable between sites, and we are not permitted to use the management network. What we need is a special VLAN created for our site to site SnapMirror replication within the DMZ Vfilers. fas1 = Primary site NetApp FAS series controller. dr01 = DR site NetApp FAS series controller. Note: This 4 year old post http://virtualstorageguy.com/2009/04/17/site-recovery-manager-its-not-just-for-vms/ shows SRM using the the script vFiler_SRM.pl. But ... NetApp TR-4064 (updated June 2012) says "The source and destination vFiler units must both be online. This means that SRM cannot be used to manage failover where the MultiStore vFiler DR capability is configured. When a vFiler unit is configured for vFiler DR capability, the destination vFiler unit is in an offline state; this is not supported for an SRM array." Note: Here, ‘bond’ is an interface group (IFGRP) made up of physical NICs. VLANID is a number from 1 to 4095. Note: REP_IP_ADDR is an IP address on the replication network. At this stage our DMZ Vfilers should be able to ping each other across the replication network! Next step is to setup SnapMirror in the dmzvfiler context!